The name LINUX derives from the first letter of Linus Torvalds name and the letters from “UNIX” jumbled in a way that is easy to pronounce. LINX is a multi-tasking environment, more that one process can be running at the same time. LINUX follows the UNIX file structure, as explained in the Operating System’s File System section File System. Everything in UNIX is stored in a file, including the various components of the core operating system. Core executables are store in /bin, while secondary executables are stored in /usr/bin. If you want to find out how to use a particular user accessible executable, use the man command to bring up one of the files in the /usr/man directory/folder. Every file/folder in LINUX is stored under the base “/” directory (folder). Unlike Windows, where items are mounted with a base letter (like the main disk is mounted under C:), UNIX mounts all devices under the main file structure. Often /mnt (for disks) or /dev (for peripheral devices) are used as mount points. The device is then symbolically linked to where in the directory structure the information is desired. 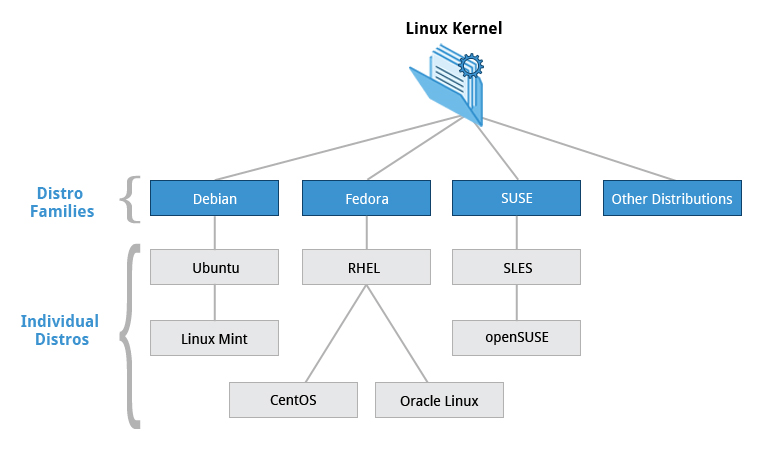 The diagram in the LINUX Foundation X section shows the various distributions of LINUX. Standard installation requires the use of a CD/DVD or USB drive. The kernel is updated every three months, but releases of each of the distributions varies, depending on the needs of the users of each distribution. For example, ATMs need a stable system. Therefore, they are usually only updated for critical defect fixes or required feature updates. Initial instillation is either primary (the whole disk is reformatted) or dual-boot (where the system can either boot LINUX or another system, mostly Windows). There are three ways to put LINUX on a Windows 10 PC. # Used ipaddress.com to see what IP addresses my system thinks where these two URL are located. You can either edit this on your PC with Notepad or on the bash shell with vi. The difference is that the bash editor puts in only a carriage-return at the end of each line, while Notepad puts in a Carriage-return plus Linefeed. Be consistent on where you edit this file to have it look nice. The apt-get command is used for retrieving applications from the UBUNTU app-store. All of the commands may not be necessary, but it does no harm to try. On the upper left hand corner of the shell is the UBUNTU logo. Click on that. The last entry is “Properties” which needs to be selected. For colors, I like light green on dark green. For Font size, I usually use either 12 or 14 point font. With this set-up you have full access to all of the Linux commands. Please remember that this is still set on the WSL kernel and not the Linux kernel.